Dissolve Theatre's current production of Ibsen's classic critique of domestic life and the right to self-determination unfolds at The Space theatre on the Isle of Dogs. 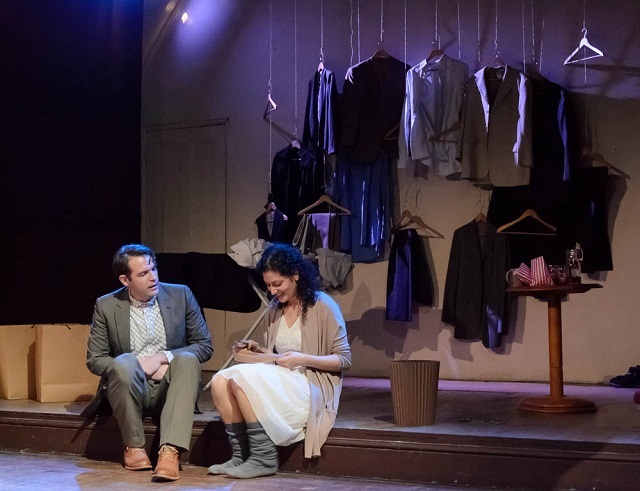 This production, with its highly minimalist set consisting of a clothes line and ironing board to evoke the confines of a domestic residence, feels vaguely claustrophobic, in spite of the lofty architecture of the surrounding theatre, a former converted church. Nora, played by Greta Gould, has forged an illegal bond to borrow money to save the life of her husband, Torvald (Johan Hallstrom), and has been secretly saving to pay off this debt. Unfortunately, Krogstad (Jack Hudson), a junior clerk at the bank where Torvald has received a promotion, is threatened with the loss of his post, and a blackmail plot develops. As the story unfolds, Nora becomes increasingly disenchanted with her husband, who also becomes increasingly patronising, treating her like a doll capable of no autonomous human feelings or thoughts of any importance. This is a stripped-back and minimal version of Ibsen's classic. The costumes and lighting do not distract from the acting, but at the same time do not give too clear an indication of time or place. Likewise, some of the acting, while proficient, seems a touch archetypal. In spite of the great extremes of emotion and the human conflicts played out by the characters, these emotions seem repressed and stilted, even at the underwhelming climax of the play. A Doll's House runs at The Space until 13 June. Tickets £14/£10 can be booked here or by phone at 0207 515 7799. Londonist saw this show on a complimentary ticket.